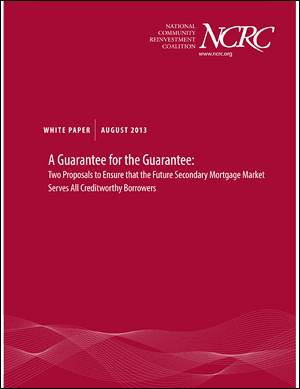 Washington, DC – Today, the National Community Reinvestment Coalition released a new white paper, “A Guarantee for the Guarantee: Two Proposals to Ensure that the Future Secondary Mortgage Market Serves All Creditworthy Borrowers.” The paper introduces two policy proposals designed to promote access and ensure that the future secondary mortgage market serves all creditworthy borrowers through conventional lending. Alternatively, the second proposal, the “Incentive Model,” introduces a sliding-cost scale tied to a secondary market entity’s business activities that address unmet housing needs. These models address a critical omission in current GSE reform proposals: none of the proposals make any clear commitment to ensuring access to conventional lending for the full scope of America’s creditworthy borrowers.